Next month, we celebrate our 10th anniversary of life here in Sonoma. In that time, we have seen only one coyote on our property. Last week, we saw our second. My husband likes to get up early and let the chickens out. They crowd together at the door inside the coop, eager to sprint out and soak up the sunshine, scratch for bugs and seeds, bathe in the dirt, and play out the minute to minute drama of life as a miniature chicken. On this morning in the summer of ’06, he let the chickens out at about 6:30 a.m., and within about 30 minutes, he heard the chickens screaming. He ran out and saw a coyote running across the lawn with a little hen in its mouth. He chased the coyote across the lawn, and then ran into the house to get his shotgun. By the time he got back outside, the coyote, and our little hen, Rosie, were gone. After that freak tragedy, we started keeping the chickens in the coop until 7:30 or 8 a.m., so they wouldn’t be vulnerable to attacks from nighttime predators who had yet to go to sleep for the day. A few days ago, I was working in my office (on the second floor of the house) at about 11 a.m. and heard the chickens screaming, which is not unusual, so I went back to work. Within moments, I saw a coyote run across the lawn. Mia and I ran downstairs and out into the back yard. The coyote was running with a chicken in its mouth. Mia and I ran after the intruder, but lost him immediately. 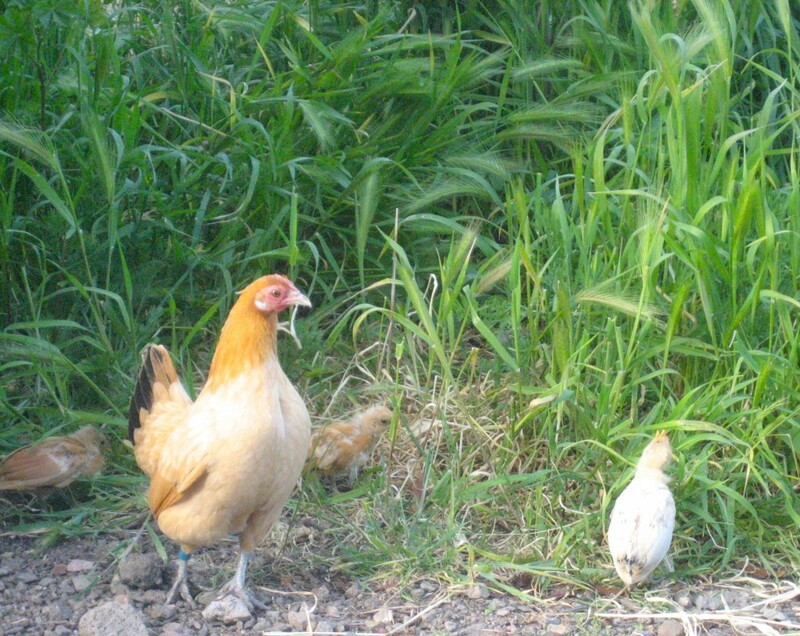 Whitey as a chick, with his Mom, Blanche. We got my husband and found our favorite, and oldest rooster, Whitey, dead in the lawn, next to the ruler of the roost, Portland, also dead. It was just heartbreaking. I feel responsible because I didn’t run down when I first heard the chickens screaming. In hindsight, I realize it was Whitey and Portland running for their lives. Bit by bit, over the next few hours, all the other chickens came out of their hiding places and darted back to their coop for safety. We locked everyone in for the next few days. Patrick ran into a neighbor down the street yesterday who said they’d seen a coyote on their front lawn at 5 p.m. the other day, which is very unusual. We are wondering if the historically dry spring has the animals in a panic for food and water, so they are forced to hunt at odd hours in unusual places. As much as I feel badly for our dear chickens, I know we’ve invaded the wild spaces that coyotes once roamed, forcing them into neighborhoods and backyards. Portland guarding the door to the coop. I will miss both of our roosters. Whitey was the sweetest, smartest rooster I’ve ever met. He was the low man on the totem pole, and was ostracized from the flock for long periods of time. For over a year, he lived alone on the woodpile next to the coop. We’d put him in the nursery with new mothers and chicks because he was so gentle and sweet. 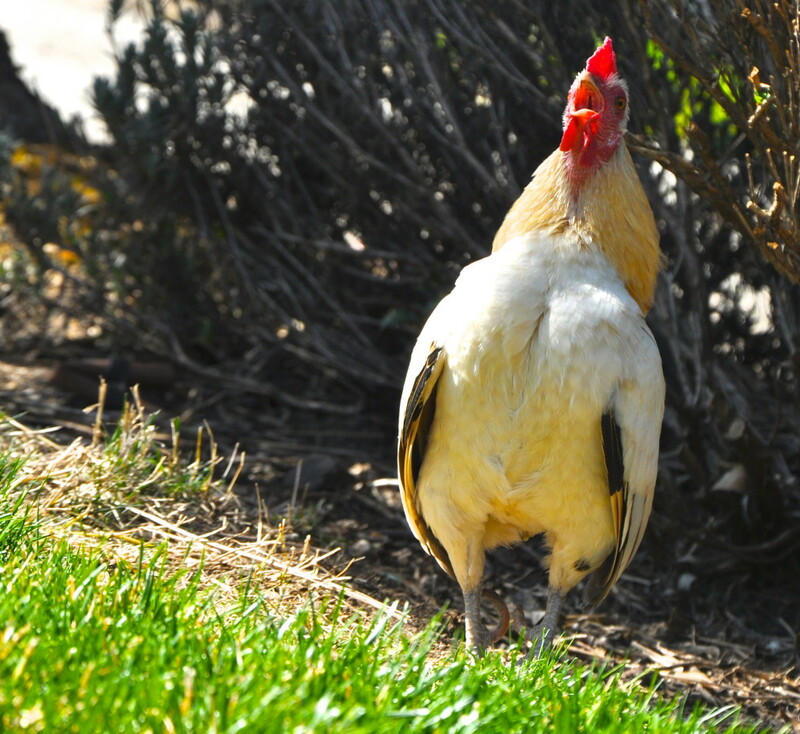 Most recently, Whitey spent his days alone in the front yard among the lavender bushes and under the apple trees. At the end of the day, we’d come out and call his name. He’d come running to us and we’d open the door to the nursery side of the coop so he quietly and safely could go in without being attacked by the high man on the totem pole – Portland. Our big dude, Portland was named after the city he came from via the postal service from my brother-in-law, who is a big bird fan. As the biggest baddest rooster, his job was to romance the hens to make as many mini-Portlands as possible. He was also expected to prevent the other roosters from cozying up to any of the hens, using force daily and without restraint. As part of his reign as top dog, he prevented the other roosters from coming into the safety of the coop as long as possible every night. 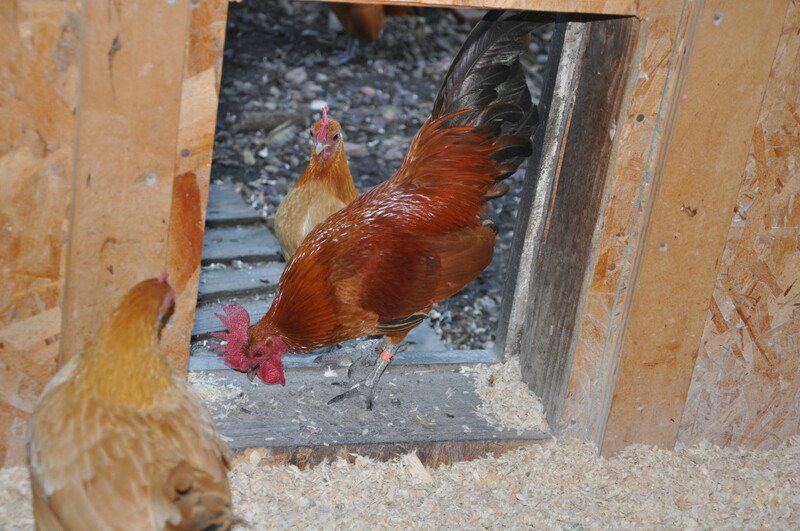 He stood at the door, graciously allowing hens in and chasing off his competition. Finally, once Portland went to the top roost for the night, the lesser roosters quietly tip-toed in. This meant the smaller, weaker guys were exposed to the perils of the nighttime predators, also part of Portland’s grand plan. Now, they are both gone. I like to believe they were protecting their hens to the end. I love reading your blog and am so deeply sorry about your loss. The natural world can be so brutal. Thanks for telling the story of your chickens. You have honored them well. Marcia, I am always struggling about whether or not we should just keep the chickens locked up in their coop and pen all the time, which would keep them safe; versus letting them free-range, which they love. It’s a hard balance, and I always wind up on the side of letting them live to the fullest, which at times involves tragedy. Thank you for reading. what noble roosters! sorry you lost them. Such a lovely tribute to your feathered friends. 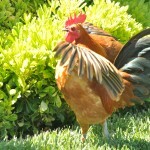 I twill be interesting to learn which of the remaining roosters is the next big dude! Thanks Gailya. Portland’s former sidekick, Banjo, has already taken over as the new heavy. Prince is still low man on the totem pole. I too love reading your blog Ligeia, although this one is a sad one. I, like you, love animals and it is sad when we lose them.sigh… Such is the circle of life!